In a post from last week, I wrote the synopsis for Optimus Rising, a tale of Autobots and Decepticons created by humanity using the scavenged technology of a Cybertronian ship and its deceased crew. The story ended with the banishment of Megatron and his forces to the Moon, a schism between the Autobots who followed Optimus Prime and those who followed his counterpart Elita Prime, and the noble death of Optimus's oldest human friend, Spike Witwicky. 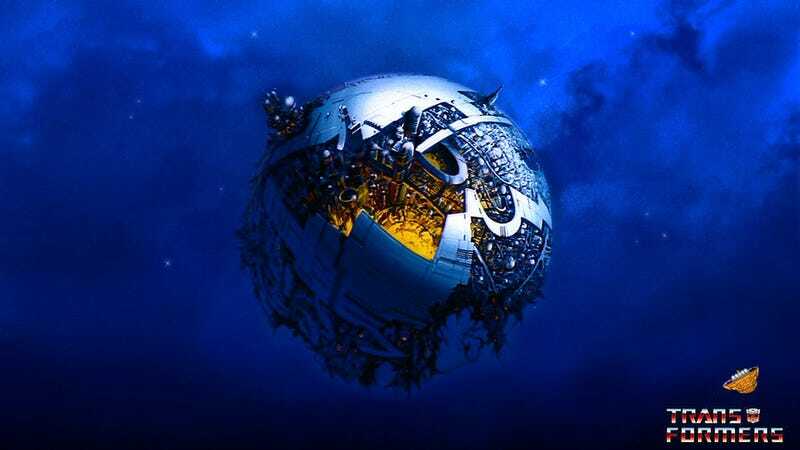 As Relic of Cybertron, the second part of the trilogy, opens, the aftermath of the battle between the Autobots and Decepticons has resulted in human public opinion turned against the sentient machines. After the tragedy of the Autobot Conference Massacre, many humans are calling for the destruction of both Autobots and Decepticons. Anti-robot attacks are at their height, forcing the Autobots and human-aligned Decepticons to hide in plain sight in their vehicular forms after Prowl is murdered by a human mob during a protest against the Transformers. Morale amongst the Autobots is low. Optimus Prime receives a message from Elita Prime, who reminds him that if he had killed Megatron and his followers when he had the chance, humanity might have been placated and Prowl still alive. This exacerbates Optimus Prime's feelings of guilt, despite Carly Miller's best attempts to alleviate that guilt. Meanwhile, Starscream leads Megatron and his followers to the site of the crashed Cybertronian ship. They kill the science team there as well as the team's military guards, and board the ship. The presence of active Cybertronian technology aboard the ship causes it to reactivate. The entire ship shakes violently, forcing the Decepticons to evacuate. The Decepticons look on in awe as the ship transforms into a mammoth robot. The disoriented giant tries communicating to the Decepticons in Cybertronian, but the human-built robots do not understand. The Decepticons and giant robot attempt to communicate with each other for many hours, the leviathan slowly absorbing the Decepticons' language. At last, the giant is able to speak English; introducing himself as the Supreme Commander of the Omega Guard, or "Omega Supreme." Omega Supreme asks about his Cybertronian crew; Starscream tells Megatron this is an opportunity to convert Omega Supreme to the Decepticon cause. 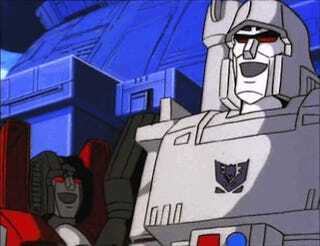 With Starscream acting as his evil Cyrano, Megatron tells Omega Supreme that humanity murdered the Cybertronians and tore apart their corpses to create their own robotic slave race. Omega is enraged, vowing to punish humanity for their sins. Megatron leads Omega to New York City. Along the way, Omega Supreme shares the history of Cybertron through an animated hologram (in an updated style of the G1 cartoon), telling the Decepticons that his world was once like Earth until its organic inhabitants created the Cybertronians as a servant class. The Cybertronians overthrew their creators, and turned the planet into a sentient metropolis known as Primus. The Cybertronians split into hundreds of different factions, many of which went to war with each other. The Chaos War destroyed Cybertron, despite Primus and the Omega Guard's best efforts. Omega Supreme gathered what Cybertronians he could, and made a blind leap into space as their homeworld shattered. The last thing Omega remembers is crashing. Megatron offers his sincere sympathy, which Starscream views as weakness. He secretly confers with his co-conspirators, Buzzsaw and Laserbeak, while Omega teaches the Decepticons how to combine their bodies into a single giant Decepticon in preparation for the assault on New York. Carly and the Autobots are in the city looking for Elita Prime and her followers — Grimlock, Arcee, and Bumblebee — unaware that the rogue Autobots have been pursuing the Decepticons ever since Megatron's forces returned from the Moon. Optimus Prime, Wheeljack, Ironhide, Hot Rod, and Jazz are approached by Elita and her squad. Elita tells Optimus that Megatron's forces are on their way with a giant Transformer, and that the only way they can defeat the threat is by working together. Elita is loathe to admit she needs the assistance, but is urged on by Arcee, who wants the two Autobot factions to reconcile. Optimus agrees to the alliance, but tells the Autobots they need to evacuate the city first. Elita thinks the idea a waste of time; evacuating over eight million people by the time the Decepticons arrive is impossible. Optimus insists, and the Autobots work with civilian Autobots and human-allied Decepticons to evacuate the city the best they can. While the humans are reticent to trust the Autobots, a passionate plea by Optimus and Carly convince the city's officials to proceed with the evacuation. Thousands of Autobots and aligned Decepticons airlift the humans out of the city. The Autobots have only half of the population evacuated when Megatron's forces attack. Omega Supreme leads the charge, demolishing entire blocks in a single blow. Many of Megatron's Decepticons combine into an Omega-sized monster dubbed the Devastator by Megatron. Optimus and Elita Prime lead the Autobot defense, while Carly continues to lead the evacuation efforts. Optimus orders the Autobots to lure the Decepticons out of the city to minimize human casualties. The Autobots provoke the Decepticons and Omega into following them, and the machines engage in a vicious battle at Camp Hero State Park, on the eastern edge of Long Island. Jazz and Arcee evacuate the few humans in the park, while the other Autobots attempt to bring Omega and the Devastator down. Omega, seeing that sentient machines are fighting him, demands to know why Optimus and the Autobots would defend a race that murdered their ancestors and enslaved them. Optimus has no idea what Omega is talking about, but Wheeljack and Ironhide do, having a detailed history of the Autonomous Robot and Deceptive Construct projects stored in their memories. They tell Omega that Megatron lied to him; the Cybertronians were killed in the crash, and the humans spent years trying to reactivate them, to no avail. It was only after two decades that the humans decided to use the corpses of the Cybertronians as templates for a new race of robots, and the robots were never intended to be slaves, but helpers in creating a better future for all life on Earth. They even tell Omega to download the Autobots' memories, as proof of their sincerity. Omega does so, and realizes the truth. Horrified at his actions and furious at the Decepticons' treachery, Omega turns against Megatron's forces, engaging in a titanic battle with the Devastator. At the same time, Optimus Prime engages Starscream while Elita Prime takes on Megatron. Carly is pinned under a fallen Decepticon while attempting to rescue Wheeljack, who is under assault by multiple Decepticons. Hot Rod rescues Wheeljack, who then retrieves Carly. He is distraught at Carly's state; her left arm and leg have been crushed, their bones shattered. Ironhide is destroyed by the Devastator, which is then obliterated by Omega Supreme. Megatron is seriously injured by Elita Prime, while Starscream renders Optimus Prime unconscious. Seeing Megatron at the mercy of Elita, and Devastator destroyed by Omega, Starscream realizes the Decepticons are doomed. So, he does what he sees is the only sensible thing: he shoots Megatron in the back multiple times. Elita and the Autobots are shocked at Starscream's actions. Starscream drops to his knees, thanking them for disabling Megatron enough for Starscream to break free of Megatron's "diabolical mind control." Starscream offers the complete surrender of the Decepticon forces, in return for amnesty. The exhausted Autobots accept Starscream's offer, and tend to the waking Optimus. Optimus rushes to his brother's side, and sees that Megatron has been grievously injured by Elita and Starscream. Filled with insane wrath, Optimus Prime attempts to kill Starscream, who flees Earth with the remnants of the Decepticons. Optimus turns his wrath to Elita, who shoves her cannon in his face and reminds him that Megatron was trying to exterminate the Autobots and enslave humanity. Jazz, Bumblebee, and Grimlock back up Elita's words, while Arcee and Wheeljack try to get everyone to calm down. As the Autobots tend to the wounded Carly and the corpse of Ironhide, Optimus approaches Omega Supreme. He offers the hand of friendship, and asks if there is anything Omega can do for Ironhide, Carly, and Megatron. Omega informs Optimus that he can rebuild Ironhide and Megatron, but only if Megatron faces justice for his actions. Optimus assures Omega that Megatron will. As for Carly, Omega says he doesn't know anything about human physiology; Wheeljack interrupts, telling Optimus that he will do what he can for Carly since she is his best human friend. The Autobots are welcomed back to New York by a grateful populace; their efforts in evacuating the city and taking the battle out of the metropolis go a long way to restoring goodwill between humans and robots.